Door Works is a full service Garage Door company. We install and service all makes of garage doors and automatic garage door openers. From exotic to traditional we carry the door to fit your style and budget. We has been serving the Northern and Central New Jersey area since 1982. Door Works has built a strong reputation of installing high quality products and standing behind our work – We are the local leader for Safety, Security and Convenience. 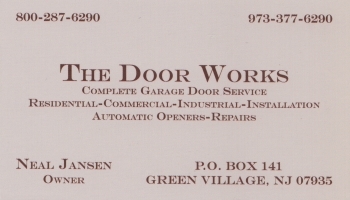 Our founder, Neal Jansen, founded Door Works in 1982 and has a reputation for reliability and quality. Neal is also a member of the New Vernon Volunteer Fire Department.